Attention club hoppers – Davis, Central, and Harvard Squares will all be giving birth to brand new clubs this year. 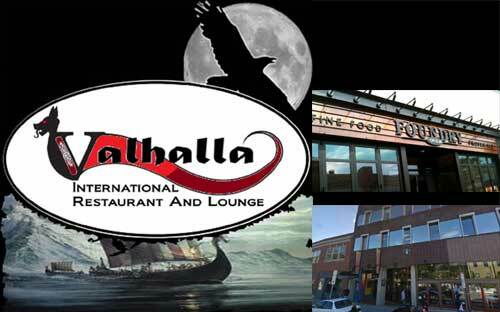 The Davis Square Theatre, which was formerly Jimmy Tingle’s Off Broadway Theater, will be adding live music shows to its schedule of theater productions (Spring); Valhalla is coming to Central Square, which is actually the All Asia Bar moving house (Summer); and The Sinclair in Harvard Square will be operated by Bowery Cambridge, the latest ‘outreach program’ by New York’s booking agency The Bowery Presents, much the same as they now do at The Royale with Bowery Boston (Autumn). Rough week? 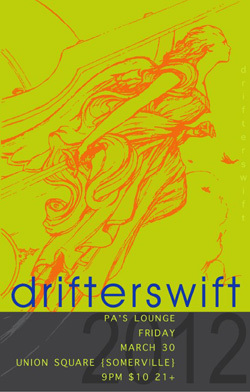 Let the dreamy and pleasantly spacey sounds of Drifterswift wash all that crap away. Head out to P.A.’s Lounge in Somerville tomorrow (Friday) night. Have a listen to two lovely new songs below. 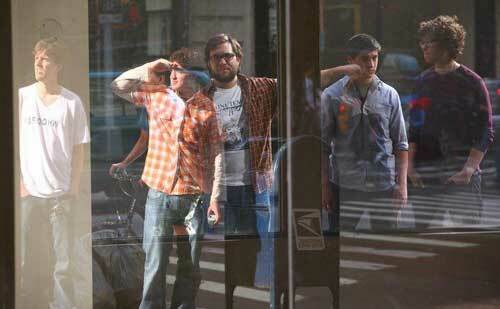 They’ll be joined by Full Time Dreamers, Paper Snakes, and The Highway. From San Antonio, Texas, to L.A.’s Eastside, songwriter, vocalist and multi-instrumentalist Sara Radle has been performing since 1996, first in the punk-pop trio Lucy Loves Schroeder, then in The Rentals with ex-Weezer bassist Matt Sharp (who convinced her to move out to Los Angeles). After releasing an EP and going on a world tour, she left The Rentals to join up with her current band, Walking Sleep (formerly known as The Flying Tourbillon Orchestra). Throughout those years, she’s also had a solo career. In February, she released her fifth album, Same Sun Shines, on which she plays guitars, drums, piano, and violin, as well as doing all the engineering and mixing herself. It was released on Jeez Louise Records, her own label. On the plucky and proud “The Pins,” she sings “I’ll do this without you.” Indeed. The result? Vibrant and poppy with a ’60s girl group vibe, and some delicately pretty, sad and sweet pop ballads. Of special note, the song “Still Here,” a chilling matter-of-fact contemplation of suicide, and a cover of “Mamas Don’t Let Your Babies Grow Up To Be Cowboys” sung as a duet with Mary Lou Lord. Sunday, 4/1 @ DC9 // Washington, D.C.
Nigerian-German songstress and activist Nneka Elise Egbuna has important things to say concerning social justice, human dignity, and the soul’s journey, and she’s been doing it in elegant fashion since 2004, when she first started working with German hip-hop producer DJ Farhot, performing in Hamburg, where she lived at the time. 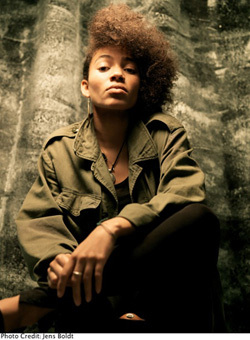 Singing in both English and her native Igbo, she cites hip-hop as her main influence, and her powerful social commentary touches on the best traditions of that genre, but her sound is unique, melding hip-hop beats with shuffling reggae rhythms, African pop and authentic ’60s/’70s soul, with strong tribal roots. 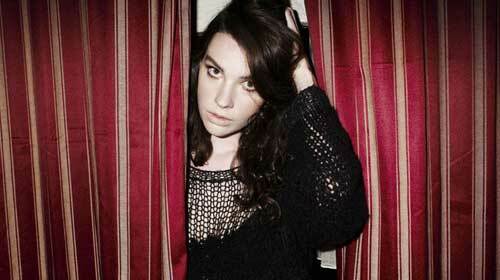 Taking from the best of all worlds, she creates an atmosphere that wraps perfectly around her amazingly agile vocals. 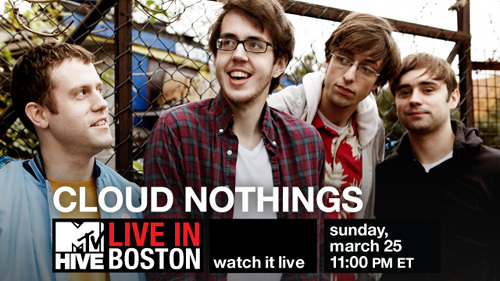 MTV Hive Live Premieres in Boston with Cloud Nothings ~ Sunday Night (3/25) at Brighton Music Hall – with Live Streaming! ::: buy tickets ::: | Live Stream 3/25 at 11pm! 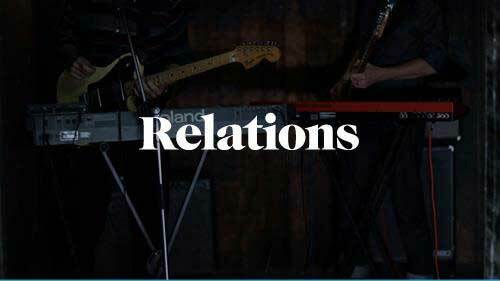 The Fenway Recordings Sessions folks have teamed up with MTV Hive for a very cool concert series which kicks off on Sunday night with Cleveland’s indie punk rockers Cloud Nothings at Brighton Music Hall. This new collaboration, Live In Boston, is an expansion of MTV Hive Live’s ongoing Live in NYC concert series at New York’s Webster Hall, that has featured such bands as The National, Sleigh Bells, The Black Keys, Two Door Cinema Club, Theophilus London, and St. Vincent. Their mission has been to bring emerging artists (and some fairly well established ones) to the masses via live-streamed concerts. With this new venture, they’ll be bringing Boston’s music scene and visiting artists to a global audience (hopefully this will also benefit the local bands on these bills). For those who can’t make it to the show, you can watch an hour of it online Sunday night at 11pm ET. 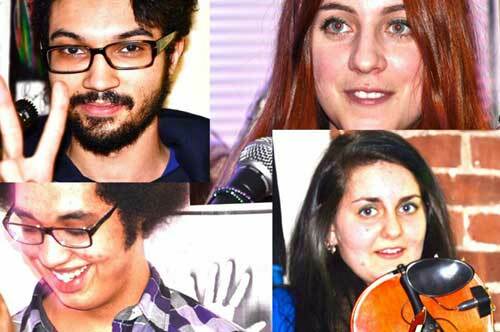 The BMH show also features Boston’s The Dirty Dishes and Bologna, Italy sextet A Classic Education. Something a bit different for me. To be honest, I’m not a huge funk or hip-hop fan (and these guys are rather surprisingly both), but I’ll make an exception for a band this good. Somerville based trio Billy Wine refer to themselves as “funk hip hop/instrumental” – sometimes they just jam out on their own, and other times they’re joined by a rapper. Check out one of their instrumentals. And if you like what you hear, keep an eye out on their sites for upcoming shows. May/ Abigail Warchild) re-joined forces last year to create music, the result being their upcoming EP, to be released on U.K. based 100m Records. You can see the first video for the track “A Savage Way to Live.” Joining them Friday night will be Boston’s own the Beatings and Louder My Dear. I’ve got something delicious for you – bluesy, folky, with a touch of jazz and an indie rock chick vibe. Here’s a ridiculously awesome vocalist, guitarist and songwriter, Grace Woodroofe. Her sound slides from quiet and sultry (“Transformer” – god I love this) to dangerous (“Bear”) to “Battles,” which is just eerie, hypnotic, and deeply sad. In the past four years, she’s been in some damn fine company – Ben Harper, Edward Sharpe and the Magnetic Zeros and Cat Power, and I predict that people will really like what they hear. Originally from Australia and now based in California, she’s just released her debut album here in the U.S., Always Want (Modular/Universal). She’ll be playing some dates on the East Coast later this month (T.T. the Bear’s Place on Saturday, March 24), before a month-long residency at the Bootleg Bar in L.A. The toughest part of this piece was deciding which of her marvelous songs to post, but you can listen to a few others on soundcloud. New Jersey-based The Nico Blues recently released their latest EP, Die Happy, and will be coming to Copperfield’s (98 Brookline Ave, between Fenway Plz & Overland St) on Friday, April 6 (9pm show). Have a listen below to their cool, warm-and-fuzzy ‘pop grunge’ sound. 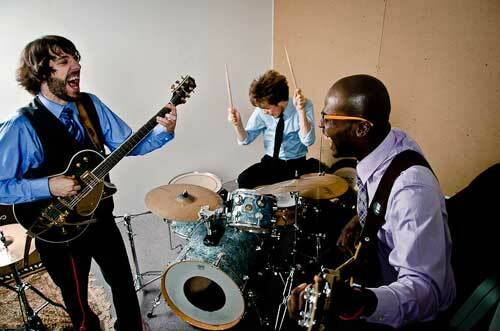 The EP was recorded, produced and mixed in their basement, and released on their own Tiny Giant Records imprint, part of the Tiny Giant Artist Collective, which they co-founded. If you like what you hear, you can ‘name your own price’ and buy it on bandcamp. Help support these guys! Here’s something incredibly beautiful for you. How’s that for an introduction? Ethereal, spacey, trippy, experimental, folky, quirky, and delightfully strange New York/Boston band (or perhaps I should say art project, because “band” doesn’t quite seem to cut it for these guys)… have a listen to SLEeVES conjuring some serious magic on their new album The Sky Ghost: Pt. 1. Acoustic guitar, piano, violin, percussion, harmonica, other unidentifiable sounds, and a flowing cacophony of vocals, each its own exotic instrument. So weird, and so pretty. Incredibly hypnotic, with surprising emotional heft. On the new album, the quartet of Justice Roman Hill, Callum Plews, Kim Schulke and Tabitha Wertheim is joined by several friends for this exquisite musical oddyssey. Highly – and I mean highly – recommended. The band also runs Analog Candle, a music production company and collective of like-minded souls, working with various musicians in the Boston area and over the ‘nets. They have a small studio and record/produce non-collective musicians for a very reasonable rate, so check them out.